dstclair wrote: Care to share the discount you were given on the 345 and is it available to others? Garmin is currently having a promotion for the 345 and the 660 for $6195 that ends June 29th. This is only a savings of about $350. I agree with you Andy. Some of this fancy Garmin stuff is not cheap in relationship to the cost of the aircraft. I wasn't all that thrilled to have to spend $1900 but it's done and over with and I am thrilled that I do have ALL Garmin stuff. And yes that extra $4000 will but A LOT of fuel and it allowed me to upgrade my "old school" strobes with some new Aveo Engineering 3-in-1 LED lights. I ordered my GDL82 from Aircraft Spruce today. Scooper wrote: I ordered my GDL82 from Aircraft Spruce today. That's great Stan, you're gonna love it. It is an awesome addition to my plane and now with IN and OUT I have a complete picture of the traffic around me. Make sure you order RG-400 cable for the GPS antenna, minimum 6.5 feet and 2 BNC connectors and 2 TNC connectors. Everything else you need is in the box. Please update us when you can after you get it installed. restlinbaum wrote: I will look into all the suggestions, I am also looking at a 796 Garmin with a GTX 345 pricey though. Many LSAs have pretty limited panel space. My Zodiac came with a GPSmap 396, and the Aera 660 fits in the same panel space as the 396, but because it has a touch screen and uses soft keys instead of hard keys, the display is much larger than the 396 display. For my panel, the 796 is just too big and the 660 is perfect. That's a nice steam gauge panel, Stan. Very functional and it has everything you'd need. 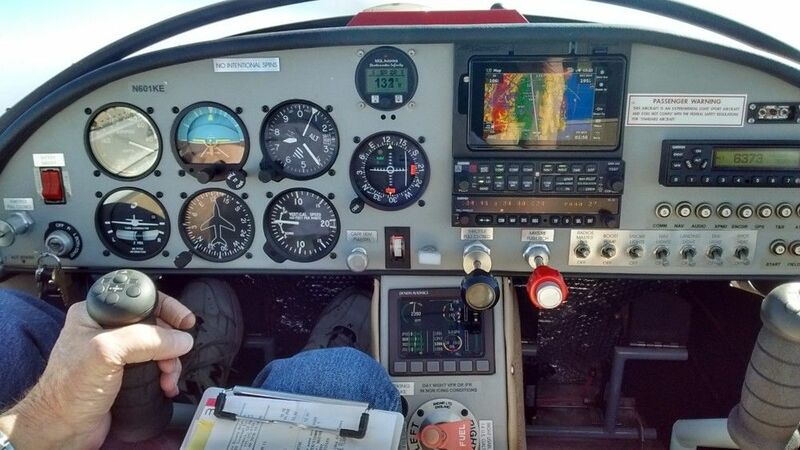 Will do, Shawn, and thanks for all the info you've provided here on Sport Pilot Talk after installing your own GDL82. I received an email from AS&S that my unit has shipped. Thanks, Andy. I love the panel, but wish it had a little more real estate. I'd like to install an autopilot and a second com transceiver and it's going to be a tight fit. Scooper wrote: Thanks, Andy. I love the panel, but wish it had a little more real estate. I'd like to install an autopilot and a second com transceiver and it's going to be a tight fit. Hmm...do you really need two coms? Your current Garmin can monitor two freqs; I can understand needing to hear two freqs, but not sure why you'd need to transmit on two for VFR ops. Flip/flopping between monitored freqs is not any less convenient than switching radios. Though you have a VOR head, and you might need the second freq on the Garmin for that. I'd just use GPS and save the two grand. You could fit a TruTrack AP head where your passenger warning placard is now, and move the placard. If you feel strongly about the second com you can exchange your transponder for a Becker or MicroAir and free up plenty of space for the com and AP head, and not need to move the placard. Two comms are handy on towered airports when you have 3 frequencies to deal with although , If you have your gps hooked up to the comm , flipping is easy ..
MrMorden wrote: That's a nice steam gauge panel, Stan. Very functional and it has everything you'd need. I've had occasion to be having simultaneous conversations on two different frequencies when flying with a pilot passenger, like talking to ATC while also talking to flight service or air-to-air. Admittedly, it's rare. I've thought about the area where the passenger placard is for the autopilot, and may be able to squeeze something like a Flightline 760A Com (2-1/4" round panel hole) in there too. Two flip-flop radios are great. Set up on ATIS, Approach, Tower, and Ground. I wonder why radios are limited to only 2 selections? Why not 4 or 6 preset buttons as you would have in a car radio? Heck, why not just have an "Airport" call up where you would just select an airport, and all the frequencies associated with that pop up on the display -- ground, tower, approach, ATTIS, etc. - and you simply touch / pick what you wanted? I get that in the old days you'd want a back up radio in case a vacuum tube went out, but is that really needed these day?? I've never had the need to "talk" to two different people but my new Garmin GTR-200 has a monitor function so I can "listen" to two different frequencies at the same time. This is helpful when monitoring tower and also listening to AWOS or ATIS. My Garmin GTR-200 is coupled to my Aera 660 GPS so it knows "where" I am and I can easily scroll through "nearest" airport frequencies. It's show me the 10 closest airports with their respective frequencies. Unicom or tower, ground, awos or atis, approach or departure, they're all right there on the Aera 660. I simply touch the frequency I want and it loads it in stand by. Could't be any easier. Even if it's not near me I can touch the airport on the map and it brings up a full list of frequencies, I just touch the frequency I want, like a preset, and it loads into standby. There's a pic of my panel earlier in this topic that shows the Aera 660 and the GTR-200. Good luck with the GDL-82 Stan. Glad to be of help. I think most glass panel/radio combinations work in a similar way. My Dynon does. It's also tied to the GPS so you don't even need to select "nearest" in most cases. It will preselect the standby airport and you select the frequency you want from "tower" "ground" "atis" etc, with a hardware button. It also has the list of nearest you can select from. This is just one of several reason I put a glass panel in my plane.